Either complete perfection or complete failure. People who think they can be good enough to get to heaven on their own merit need to understand there are only 2 options for them. Either they are completely perfect or a total failure. 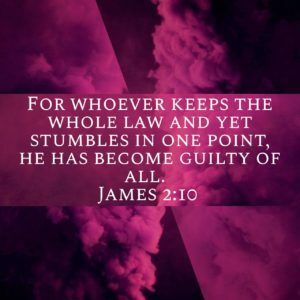 Read James 2:10-11. Verse 11 goes on to give an example, but the implication is clear. If you miss in just one area, then you have failed in everything. The idea that God will weigh out the good deeds versus the bad deeds is completely false. This is an all or nothing situation. So many people believe that they can be “good enough” to go to heaven, yet this makes it clear they can’t. None of us are good enough on our own. We have failed to meet the standards that God requires. The only option for us is death, according to Romans 6:23. We need a Savior! Enter Jesus Christ. He is the only one who was able to be perfect in every area. As the sinless Son of God, He is the one who can bridge the gap that our sin and failure has made. We must ask for forgiveness for our sins and turn the control of our lives over to Him. He is the One we need. Will we turn to Him today?